Politico‘s front page has gotten a minor face lift. Think of it more like a deep cleansing facial with a few extractions. They’ve gotten rid of the “hot topics” links. A red strip has been placed under the top verticals bar. Sub-headers (“Politico Opinion,” “Politico Blogs,” etc.) down the right column have been further distinguished with black boxes. But most conspicuous is that CLICK, the publication’s D.C gossip blog that has struggled to have a real sense of direction, has been removed from the top verticals bar altogether. The tab that once said “CLICK” has been replaced with “Blogs,” which when hovered over, displays the site’s political blogs, including CLICK. It’s not exactly Earth-shattering, but CLICK went through a series of changes this year that have transformed it from a glitzy spinoff of Politico to a minor afterthought. Now it’s even less noticeable. What’s striking is that even its own reporters don’t clamor to be a part of it. Back in May, one of CLICK’s most prolific reporters, Patrick Gavin, left to join Politico’s homepage. Even Amie Parnes left to quasi cover the White House (er, squishy stories about Michelle Obama) and only rarely contributed to the blog. The next month, CLICK was downgraded from its visually-appealing, full sister-site status into a simple top-to-bottom blog. Less color. Less flavor. More vanilla. 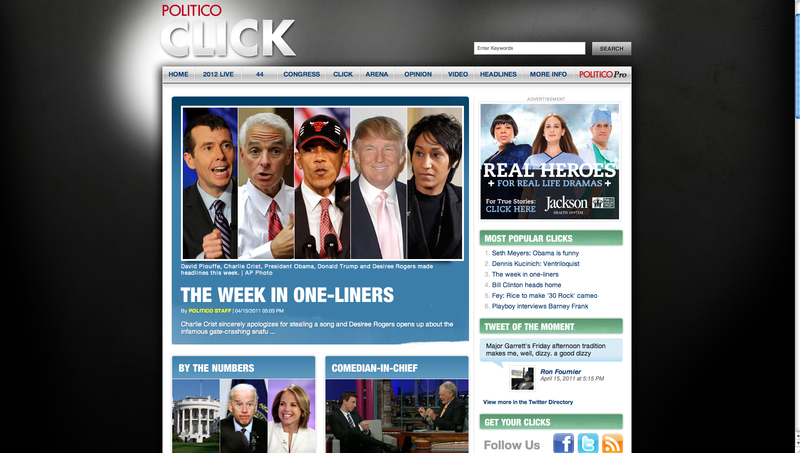 After Gavin made the move to the site’s homepage, Editor-in-Chief John Harris told us CLICK would remain a part of Politico. “Click is staying put,” he said. But this is looking more and more like nails in a coffin.